The Jacks will be looking to bounce back from last week’s disappointing loss at Floreat Athena, when a late goal from former Jacks winger Jon Stynes won it for the home side. (Photo – Jacks defender Rikki Smith is inline for a recall after injury) Jacks assistant Coach David Tough said it wasn’t the best game of football, but he thought they deserved something from it. “It was one of those games which looked like it was going to be a scoreless draw, which I thought over the 90 minutes I think would have been a fair result,” he said. Tough said Saturday’s opponents are flying at the moment, but they have worked extremely hard on the track this week and we’re confident we can get the right result. 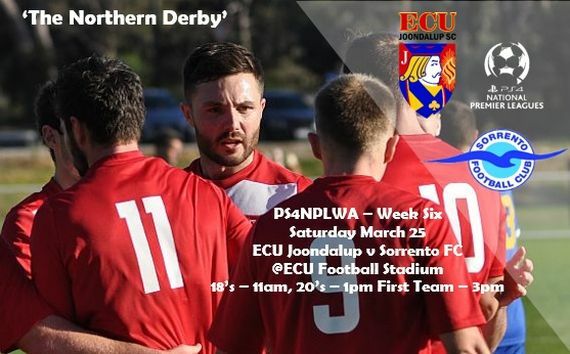 “I think the Sorrento game is perfect for us to bounce back with and kick start our season,” he said. In team news Rikki Smith has had two full games in the under 20’s and is close to recall, while Kevin Moon is also back to full fitness, while youngster Keylun Pollard, Logan McIsaac, Fraser Garnaut, James Owen and Sam Pollard all impressed in the under 20’s last week and are pushing for a spot in the squad. Sorrento will be without the suspended Ryan Pearson.